ARLINGTON, Va., July 17, 2017 (GLOBE NEWSWIRE) — The world’s largest 100 alternative asset managers saw assets under management increase by 10% in 2016, rising to $4 trillion, according to the 2017 edition of Willis Towers Watson’s (NASDAQ:WLTW) Global Alternatives Survey. The survey, which captures long-term institutional investment trends by seven main investor groups across 10 alternative asset classes, showed that of the top 100 alternative investment managers, real estate managers have the largest share of assets (35% and over $1.4 trillion), followed by private equity fund managers (18% and $695 billion), hedge funds (17% and $675 billion), private equity funds of funds (12% and $492 billion), illiquid credit (9% and $360 billion), funds of hedge funds (6% and $228 billion), infrastructure (4% and $161 billion) and commodities (1%). What are the benefits of investing in alternative investments? Are these investment mainly for high net-worth individuals? Alternative investments can serve different roles in a portfolio, either return enhancers or risk reducers. Some investments, such as private equity and venture capital, have high expected returns. Allocating assets to these return-enhancing investments increase the expected return on the portfolio. Most other alternative investments, such as commodities or hedge funds, serve roles as diversifiers in a portfolio. That is, the return to commodity investments are driven by different risk factors than are stocks and bonds, where stocks and bonds may be negatively affected by inflation while commodities can benefit during times of increased inflation. Interest rates remain close to historical lows, despite the global economy growing at a steady pace, and the search for yield is becoming more and more difficult. Although the US Federal Reserve is in a tightening cycle, this remains gradual and the central banks of many other developed countries maintain accommodative monetary policies. The European Central Bank (ECB) has not yet provided details on its plan for exiting its quantitative easing programme. But leaked comments on tapering suggests modestly higher interest rates in the next two years as the economic situation continues to improve. Meanwhile, the Bank of England is likely to be cautious on raising interest rates. It needs to balance inflation concerns and growth prospects against an uncertain background of Brexit negotiations and a minority Conservative government. My colleagues — J.P. Aubry and Anqi Chen — and I are completing a study on the impact of changes in the investment portfolios of state and local pension plans. Since the financial crisis, public pension plans — like other large institutional investors — have moved a significant portion of their portfolios into investments outside of traditional equities, bonds, and cash. These alternative investments include a diverse assortment of assets, such as private equity, hedge funds, real estate, and commodities. Between 2005 and 2015, the allocation to alternatives more than doubled (from 9% to 24%) (see below). This shift reflects a search for greater yields than expected from traditional stocks and bonds, an effort to hedge other investment risks, and a desire to diversify the investment portfolio. Will it be a happy new year for your investment funds? Stock market investors have seen bumper returns, with the FTSE 100 soaring after the Brexit vote. We ask some of the biggest names in the business for their 2017 predictions. The FTSE 100 index of Britain’s biggest stock market-listed companies has enjoyed its strongest year since 2009, jumping from 6,137 at the start of the year to touch nearly 7,000 this week. Wall Street’s S&P 500 has hit record highs, with British investors gaining even more in sterling terms because of the fall in the currency. This has meant that some of the biggest funds popular with small investors – such as M&G’s £6.3bn Global Dividend – have made gains of nearly 40% over the past year. But not everyone has shared in the party. The single biggest fund in the UK, Standard Life’s £26.3bn Global Absolute Return Strategies, has managed to lose money when almost everyone else has been coining it. The fund is down 3.3% over the past 12 months, compared with the 17% gain made by UK index-tracking funds over the same period. Star fund manager Neil Woodford has also had a poor year, making just 2.7% over the past 12 months for investors in his popular £9.2bn equity income fund. The prize for the best performance of any fund in the UK goes to the little-known JFM Gold, which has given investors a return of 128% over the past year. Unfortunately, it’s only a £20m minnow, so we took a look at the big funds instead. M&G Global Dividend performed best, rising 39.4%, while Fundsmith Equity was up 28.2%. Both are heavily invested in Wall Street-listed stocks, which have rocketed in sterling terms. For example, Microsoft (a big holding in both funds) was trading at $54.80 at the start of the year and was $63.14 this week – a rise of 15%. But in sterling terms that translated into £37.27 at the beginning of the year, and £49 now – a rise of 31%. While the post-Brexit plunge in sterling will make holidays more expensive for everyone in 2017, it has turbo-charged returns for pension and Isa holders with investments in big US companies. Billionaire Brexiter and hedge fund manager Crispin Odey reportedly made millions around the referendum, but investors who put money into his Odey Absolute Return fund won’t be smiling. It was the second worst performing fund of the year, losing 15.7% and beaten to the bottom only by an absolute return fund from Argonaut Partners. These hedge fund-style investments became popular a decade ago, but in 2016 almost everything with the words “absolute return” in their name turned into absolute rubbish. Sadly, we can assume their managers will still receive giant pay packets for their sterling performance. The former BBC economics correspondent reckons Donald Trump’s spending will boost the US economy in the near term, but US shares look fully priced, and Westminster has cloth ears about the Brexit issues facing London banks. “Politics and policy are likely to dominate the headlines again in 2017. Voters have decided against business as usual and, increasingly, investors are also expecting a change. Whether either will be satisfied remains to be seen. “The eurozone and Japan have come to the conclusion that when it comes to pushing down long-term interest rates, you can have too much of a good thing. So investors should not expect capital gains on bond holdings to compensate for low interest rates as they have in the past. 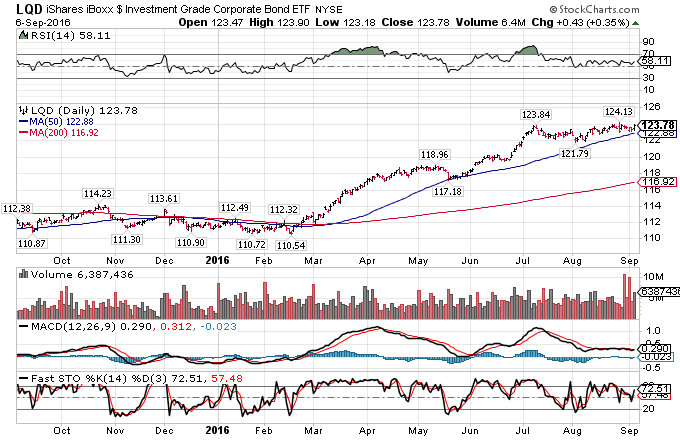 People have been predicting a turn in the bond market for several years, only to see bond prices reach new highs. But in the past few years, inflation was heading down, not up. This time it really does look different. http://enterpriseuk.co.uk/wp-content/uploads/2016/06/stifled.jpg 500 1000 Cagatay Kirici http://enterpriseuk.co.uk/wp-content/uploads/2017/06/EmtUK_FinancialEcosystem-300x98.png Cagatay Kirici2016-12-30 14:54:542017-01-04 14:57:51Will it be a happy new year for your investment funds? Fixed-income investors looking for protection from rising interest rates may want to turn to a surprising haven: junk bonds. It sounds like a bad joke. High-yield bonds, issued by companies rated below investment grade, are loaded with credit risk. If the economy weakens, they fall in price. If recession looms, they plummet. But if President-elect Donald J. Trump gets his way—a big if—there is little chance the U.S. economy will go into recession in 2017. Stocks have already run up—and bonds fallen—on expectations that his initiatives will lead to lower taxes, lighter regulation, and more government spending. That should mean faster economic growth but higher inflation and rates. In that scenario, moving assets to short-term bonds and whittling back on Treasuries makes sense. 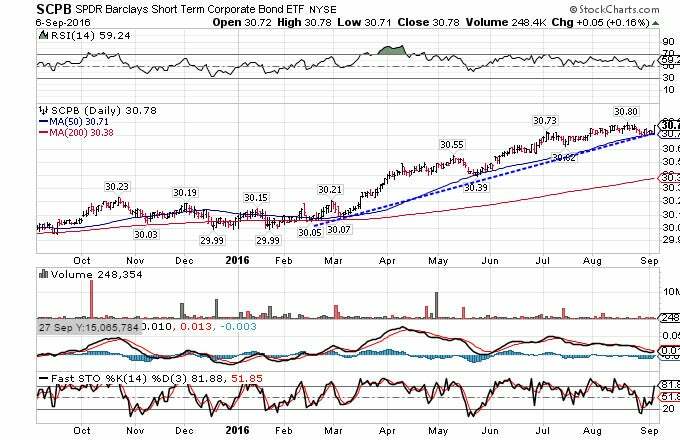 So-called bond proxies like real estate investment trusts and utilities look treacherous. So where is an investor supposed to turn for yield? That’s when an allocation to high-yield bonds starts to look appealing. These bonds yield 6.6% on average and correlate more with stocks than Treasuries. As long as rates rise gradually, the high coupons can compensate for price declines, says James Kochan, chief fixed-income strategist at Wells Fargo Funds. Since the election, investment-grade bonds are down 2.4% and Treasuries are off 2.6%, but high-yield bonds are just 0.23% lower. Take note: This isn’t a prediction that junk bonds can generate the same double-digit returns next year that they did this year. Thanks to a strong rebound following the commodity-related swoon in February, junk bonds are up 13% in 2016. This is despite a round of profit-taking that started in October when rates first started to rise. Mid-single-digit returns in high yield seem likely for 2017, several portfolio managers tell Barron’s. That may look pretty good a year from now. Gershon Distenfeld, portfolio manager of the AB High Income fund, has reduced his fund’s high-yield exposure to 50% from 70%, but he thinks the asset class is a better bet than stocks at current prices. “Investors have to brace for lower returns across a lot of asset classes,” he says. Valuations in high yield aren’t particularly attractive, notes Mary Bowers, a high-yield portfolio manager at HSBC Global Asset Management. “Still, I think return potential looks better than other parts of fixed income,” she says. She is adding more floating-rate securities, including some hybrid ones issued by financials. Bonds rated B, a midlevel rating within high yield, are the “sweet spot,” she says, as they have less interest-rate risk than the higher-rated BB bonds. Regina Borromeo, head of international high yield at Brandywine Global, is also adding more floating-rate securities, such as corporate loans, which yield around 4%. “It’s a way for investors to get attractive credit spreads without as much duration risk,” she says. She notes that junk bonds with shorter maturities are holding up better than longer-term bonds . than invest through a fund, says Thomas Byrne, director of fixed-income at Wealth Strategies & Management. High-yield bond-fund prices are likely to fall as rates rise, and high redemptions could make declines worse in a sharp downturn, he notes. In contrast, investors who hold individual bonds to maturity will most likely get back what they invested—junk-bond default rates run about 5%—and can then reinvest proceeds at higher rates. In such cases, the bond’s yield at purchase becomes the total return, says Byrne. This approach means less opportunity to benefit from price appreciation. But at current valuations and given the outlook for interest rates, such gains are less likely anyway. As investors across the globe search for stability and income, it is becoming more common to see investors shift capital from fixed income securities into the equity market. It should be no surprise that the shift away from the bond market and into equities is heightening the risk profile of many portfolios by reducing the benefits of diversification. Rather than completely abandoning bonds and other fixed income assets, another option could be to consider corporate bonds through various exchange-traded funds. In the article below, we’ll take a look at the patterns and try to determine where prices are headed from here. 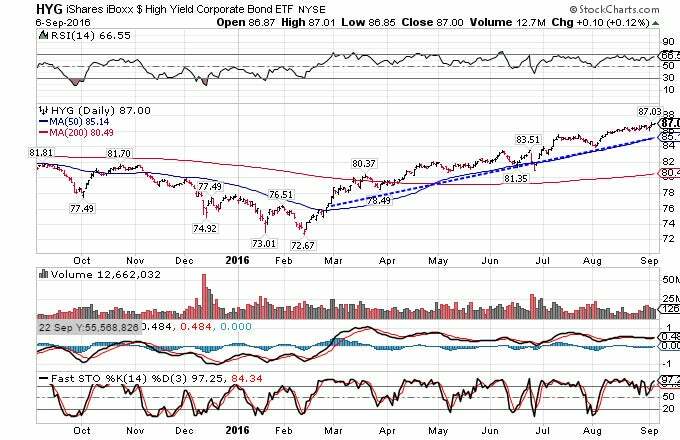 Another popular ETF used by traders looking for alternatives to dividend paying stocks is the iShares iBoxx High Yield Corporate Bond Fund. The managers of this ETF seek to provide investors with exposure to a broad range of U.S. high yield corporate bonds for a reasonable expense ratio of 0.50%. So far this year the fund has moved higher by 12.21% and based on the chart below, it looks like the momentum could continue. Notice how the ascending trendline and the 50-day moving average have helped act as strong levels of support. Based on technical analysis, this type of behavior is expected to continue and many traders will maintain this bullish outlook until the price closes below $85.14. For investors who would like to reduce the risk of their bond holdings more than what is offered through the funds mentioned above, one of the most popular options would be the iShares iBoxx $ Investment Grade Corporate Bond ETF (LQD). This fund offers investors access to more than 1000 high-quality corporate bonds in one holding and has total net assets of nearly $33 billion. Fundamentally, the low expense ratio of 0.15% also makes this fund appealing to all types of investors and based on the chart below it is trading within one of the strongest uptrends found anywhere in the public markets. Active traders would likely maintain a bullish outlook on LQD until the price closes below $122.88. The global interest rate environment and thirst for yield have led many investors to shift capital from the fixed income market and into equities. Based on the charts of the bond funds shown below, rather than moving entirely into stocks it could be time to add some corporate bonds to your portfolio. Numis Securities Charles Cade reveals why he thinks recently launched closed-ended portfolios in the alternative debt space should avoid the fate of similarly vaunted vehicles in previous years. Newly launched investment trusts are more likely to weather potential market headwinds unlike examples in the past, according to Charles Cade (pictured), head of investment company research at Numis. At times in the past, it has been recently launched trusts – which have usually come to market due to sheer demand from investors wanting exposure to new hot investment trend – that have been the first to be wound up as market conditions change. The investment trust sector is often praised for its constituents’ longevity with some well-known ITs launched decades (and sometimes more than a hundred years ago) still performing strongly. However, initial public offerings (IPOs) for popular investment trends have tended to come in waves with many newly launched trusts ending up closed, merged or wound-up. In fact, only about one in four of those launched between 2000 and 2009 (326) have survived in their original form. One of the bigger trends in the space in recent years has been a spate of launches seeking to provide ‘alternative income’ exposure and 2015 in particular was a bumper year which saw many new portfolio names on the London market. In the first three months of 2016, however, there has been the lowest number of investment trust launches since confidence tentatively returned to markets in early 2009 from the depths of bearishness induced by the financial crisis. This was reflection of severe volatility in both equity and bond markets, says Cade, as well as a widening of many discounts, particularly among the nascent alternative income portfolios which raised significant amounts of capital in recent years. “The lack of IPOs in 2016 to-date could be viewed as a sign that the current phase of alternative income IPOs has come to an end,” he said.